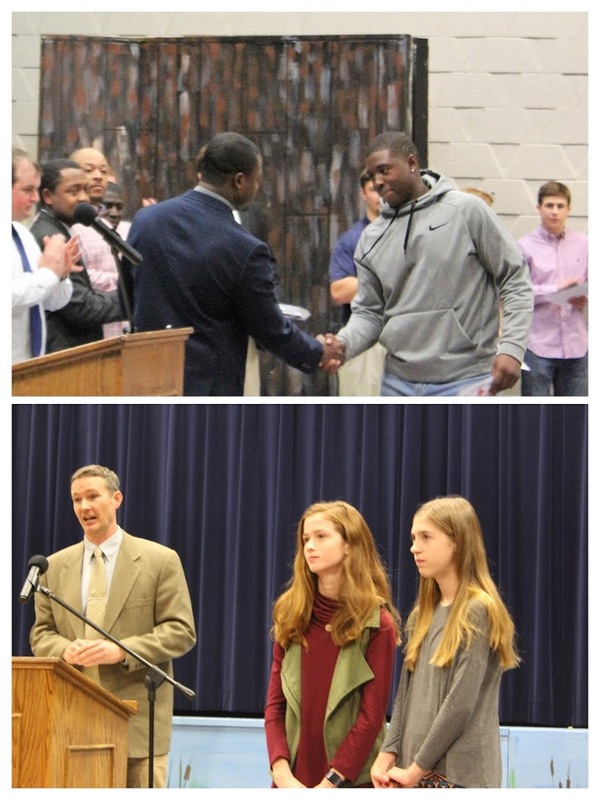 On Wednesday, January 10, Strom Thurmond High School awarded their fall athletes. Coach Hite remarked, “We are very proud of our teams and our student athletes who truly committed to our pride, class, courage, and the will to win mindset (PCCW!). A few of our high lights from the fall include: Academics remaining a priority for our student athletes and there were a record number of athletes on A and A/B Honor roll this fall. The football team participated in the SCHSL living clean initiative and picked up litter to help clean our school and surrounding areas. Our swim team had a record number of participants and the first state qualifier in school history. Volleyball won the first Region Championship in School History and hosted the first home playoff game in school history. STHS had 14 All Region Performers: In football Tyrek Williams was 2017 Region All-Purpose Player of the Year, Jaquan Edwards was 2017 Region Player of the Year, and Tre Moore ranked 2017 Region Defensive Player of the Year. The following players filled made the All Region distinction: Ty Johnson, AJ Valentine, Ford Williams, Lawson Reel, Chris Price and Charles McCoy. For Volleyball Avion Mahoney, Hannah-Grace Humphries and Rebecca Lorimer were honored while Hannah Grace and Rebecca made North South Players. Their coach, Nick Lorimer, was earned Region Coach of the year. Cross Country Girls Haviland Graham and Graycen Sanders were tributed. The three 2017 Region Players of the year were Jaquan Edwards, Player of the, Year, Tyrek Williams- All-Purpose Player of the Year and Tre Moore, Defensive Player of the Year, while the 2 Shrine Bowl Players were Tyrek Williams and Tre Moore. STHS had six Border Bowl Players: AJ Valentine, Chris Price, Javin Holston, Tre Moore, Jaquan Edwards, and Tyrek Williams. Congratulations to all our student athletes and coaches on a fantastic fall sports season!